Vadodara & Gandhinagar 40.0 C.
Pune touched 37.1c as expected, and Mumbai was 35.3c, while Aurangabad recorded 36.4c. Hottest in Maharashtra was Solapur recording a scorching 39.8c. Bangalore was 34.4c, while Hyderabad was the forecasted 37.6c. Chorr in Pakistan reached 40.2c on Saturday 21st, and Karachi was 34.5c. Cuddapah touches 40c on 19th March...! Next few days we see dry weather prevailing in the Indian Sub Continent. Day temperatures start heating up, and will tend to range between 37-39c in the pink shaded regions.. The heating trend will start from Thursday 19th in Eastern Vidarbh and adjoining regions of Telengana. Initila heating also starts in Parts of North Gujarat and Saurashtra. Westerlies. (First mentioned in posting of 12th March on this blog). amounts in North and NW India...and Central Sindh and Rajasthan... more of that later. Forecast till Sunday 22nd March. Mumbai: Almost clear, with some high clouds next few days. Days will be around 36/37c till Sunday. Evening North winds will result in pleasant minimum temperatures till Friday. Subsequently, we see the humidity and night temperatures rising marginally. Pune: Slight clouds. The days will be around 35c till Friday, and weekend we see days getting hotter to 37/38c. Aurangabad: Almost clear skies and warm. Days around 35c, but getting to 36c by Sunday. Delhi NCR: Almost clear, and warming trend. Maximum days temperatures to cross 30c from Friday 20th. Next spell of rains around 24th/25th. Kolkata: Warm, getting hot by the weekend. Currently around 33c, but gets hotter by weekend. Would expect the day to touch 36 or 37c by Sunday. Goa: Will be sunny and warm. 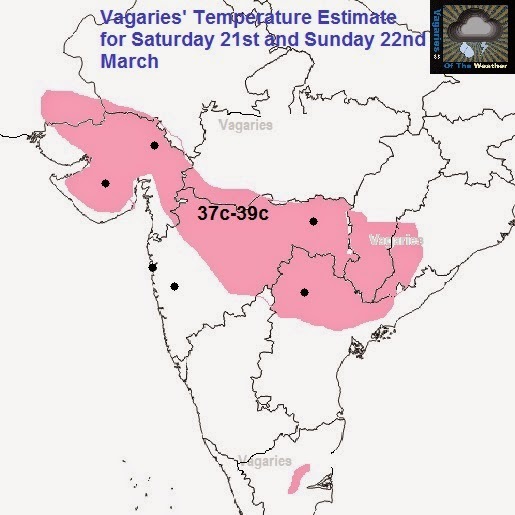 This weekend, the day may touch 35/36c, which would be normally high for Goa. Bangalore: Warm and clear. Days around 35c, maybe rising to 36c on Sunday. Karachi: Getting steadily warm. Risng from 33c on Friday to reach 37c by Sunday. Hyderabad (Sindh): Also getting warmer. Rising from 36c on Friday to reach 39c by sunday. Gujrat (Pakistan): Partly cloudy skies. Days pleasant at 25c, but rising by the weekend. Likely to touch 30c by Sunday. As you mentioned Anantpur was 39 celcius today. That is just 1 celcius above normal so there is nothing unusual here. correct saurabh - hence mentioned "nearing". add to this kind of horrible drought over anantapur-rayalseema-cuddapah - series of monsoon failure- god knows what is in store- infact whenever temp exceed 40c over rayalseema - Bangalore heat wave starts - being very close to rayalseema- guess in few days number of people allowed in Tirupathi will be reduced due to water unavailability. 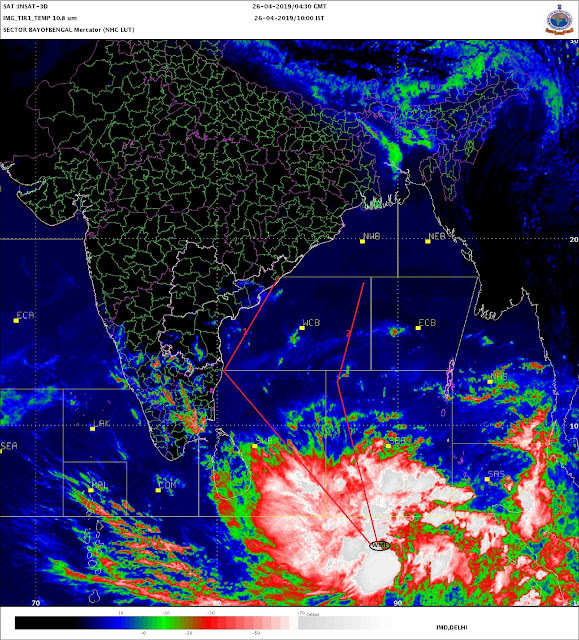 rajesh sir,are you expecting rains from 27th -31 st march in maharashtra including konkan and mumbai? Super Hot in Bangalore.. Summer in full fledged..
Rajesh Kumar - Bangalore BBMP/BDA has not planted any tree saplings in last 4 years - resulting in barren desertification of BANG - entire BBMP/BDA is pool of corruption - why not they learn from "NAVI MUMBAI"
March 20 - is world sparrow day. Due to loss of native trees - sparrows have totally disappeared from BANGALORE - last seen only 15 years back. Sparrows require native trees like peepal,banyan,jamun,figs,mango,neem - these trees live for 100s of years. Mumbai/NAVI MUMBAI/THANE tops highest among all cities in India for highest number of delightful/chirpy sparrows!! Even the tree cover in Mumbai is depleting day by day..especially western suburbs.I see trees drying for no reason. and concret jungle all around. Even there are plans of trees to be cut in Aarey jungle. Almost heat wave like conditions in Interior N. Konkan !! As getting more hotter on straight 6th day today !! Karjat 41.9°C so had 4th consecutive day with 40+ temp !! Badlapur & Thane same @ 40.0°C both sees first 40c mark temp for year 2015! Area's which are 15kms to 40kms away from sea coast(i. e. inland N. Konkan cities) are getting baked and on other hand Mumbai, Alibag & Dahanu on coast are enjoying pleasant weather compare to Interior Konkan !! As due to early setting in of W sea breeze. When is the next Update going to come Rajesh Sir? 40Degrees in Borivali(Mumbai) at 1:00pm.Super Hot! Sir,When you will give Forecast for expected Rains in Konkan in coming days and also Mumbai update? Heat wave grips Interior N.Konkan with Mumbai also crosses 40c mark temp today !! Thane IMD AWS 42.8°C so had 2nd consecutive day with 40+ temp !! Karjat 42.4°C so had 5th consecutive day with 40+ temp !! Badlapur 41.8°C so had 2nd consecutive day with 40+ temp ! !